I found your company on the web. I called into the office to get your email address. Is this a slab jacking project that you might have an interest in?? 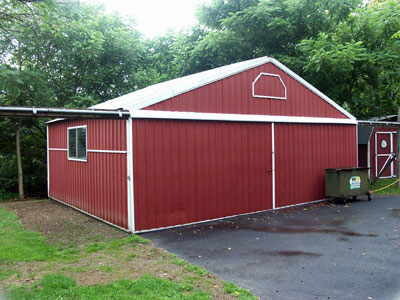 It measures 24′ x 30′ and has a slab that was poured in 2 sections of 12′ x 30′. The problem with the slab is that the back end has cracked and sunk down almost 5″ toward the rear. 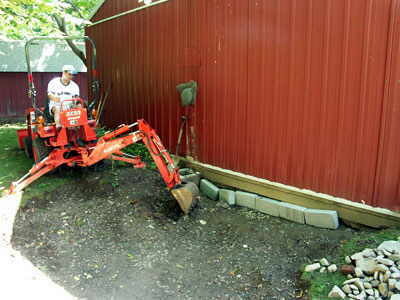 We rented a backhoe and dug out under the slab to install a support. We created a hollow for the insertion of a support column. We dug in about 6 feet. The cause of the sinking turned out to be settling earth beneath it. There is a 4″ to 6″ gap between the floor and the earth. The entire slab seemed to be held up by the rebar. We created a column using concrete block. The jacks were used to push the bricks down under the weight of the slab. The idea was that eventually we would hit solid ground to establish a foundation point. We went down about 6 feet before that happened. 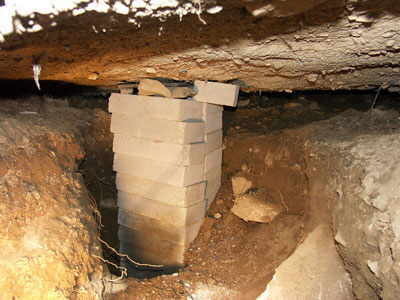 There are 18 blocks piled up on the load bearing column. We were able to lift the slb up 4inches. However we lost some of that when we transferred that last block onto the column. ( I know there were better ways of doing this, but we were on a limited time schedule and this seemed to work at the time.) 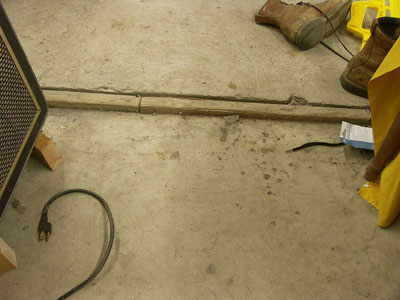 The net result was that we gained 2 1/2″ on the low point of the slab. Here you can see where it rests now. The good news is that the floor will be stablilized for a while. The bad news is that we still have a 4-6″ gap under a good part of the floor and it may sink again. 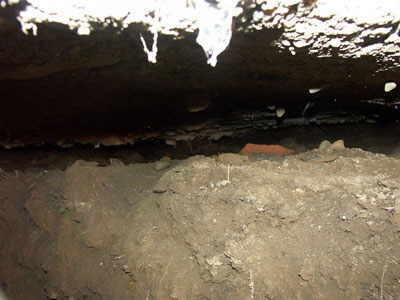 Is slab jacking a cost effective means to fix this problem ??. My fear is that it just might be too much money for this size and value of the building. Is there another solution that might be better ?. I have considered just knocking some holes in 2 or 3 sections of the slab and pouring a low slump concrete to fill in as much as possible. Or perhaps can I get away with using flowable fill. Will flowable fill support this load?. Your comments and quote is welcome. Please feel free to contact me. Call anytime during the day. I work at home.